Arriving at the Masquerade, long before the rooms have begun to fill; with the awful farce of blank, lifeless buffoonery which presents itself at your entrance; till, at length, you are exhilirated by the average allowance of lethargic Harlequins, drunken Hermits, buckish Magicians, sneaking Emperors, august Tinkers, dejected Merry-Andrews, hoydening Abbesses, drivelling Minervas, lusty Ghosts, etc. etc. what little character there is lying exclusively among the Dominos. Everyone is encouraged to come in Regency-era masquerade costume for the Vauxhall Masquerade! At the masquerade ball ball shown above, there are historical outfits, costumes inspired by the Italian Commedia dell'Arte, "ethnic" costumes of dubious accuracy, and a few folks who seem to be in normal Regency dress but are still having a great time. We don't expect our ball to be quite this raucous, but we do hope to see folks turn up in a variety of costumes. Masks are definitely encouraged! Please do remember that this is a Regency event, with the loose interpretation of that being 1790-1825. Modern Halloween costumes are usually not appropriate (sorry, no Friday the 13th slasher costumes or naughty nurses), nor are time-travellers from eras after 1825. Historical outfits. Any era from the Regency on back. Medieval, Renaissance, Elizabethan, Puritan, eighteenth century, etc. Please keep in mind that we will be dancing, so large panniers or farthingales are somewhat impractical and trains are a very bad idea. Ethnic costume. These often were more "inspired by" than accurate. Turkish sultans and sultanas were popular, as were Chinese and Egyptian outfits. England of course had plenty of contact with India in this era, so that would also be especially suitable. Scottish dress was also enormously popular, so bring on the kilts! Characters from Greek mythology. It's very easy to drape a "Grecian" gown over a Regency dress. Styles of the era were inspired by those of ancient Greece already! Adding a symbolic element or prop is all you need to do: a crescent moon for Artemis, flowers in the hair for Persephone, a helmet and spear for Athena, harvest symbols for Demeter, a lighting bolt for Zeus, a trident for Poseidon, and so on. Characters from Commedia dell'Arte. Harlequin, Pierrot, Columbine, etc. Masquerade balls had their root in Italian celebrations of Carnivale, and these stock comic characters remained popular into the nineteenth century. Abstract concepts. This is probably the easiest to do for women. Start with your ballgown color. Add some decoration to create a theme. Flowers are the easiest: just pick a color to match your gown, make a wreath (fake flowers are fine) and go as that flower. If your gown is white or silver, add a headdress with a moon or stars. If black, add some spangles and go as the starry night sky. There's lots of room for imagination here! Regency naughtiness. Skirts just below the knee on a peasant costume. Women cross-dressed in men's outfits. Religious costumes (priests and nuns) were meant to poke fun at Catholicism. Cover up. The classic 18th century masquerade out fit was the domino, a tent-like cloak that covered the whole body, sometimes with a hood as well. Classically these were black, but colors such as goldenrod, blue, white, and burgundy were also known. Both men and women could wear domino. Just wear a mask with a regular Regency outfit. That's fine! Not everyone dressed up. Jane Austen's niece Fanny described the fancy dress costumes at the family Twelfth Night celebrations in 1809 and 1812. Some of the characters are still very familiar: a fortune teller, shepherdess, Cupid, Bo-Peep, Red Riding Hood, etc. If masquerade dress does not appeal, ordinary Regency ballgowns for ladies and formal or military wear for gentlemen is always appropriate. If you do not have Regency-era costume, then modern formal wear (long gowns for women, as formal as possible for men) is fine! Some images to give you ideas are below. But do not drive yourself crazy over costuming. The goal is to have fun and dance! Everyone is welcome! 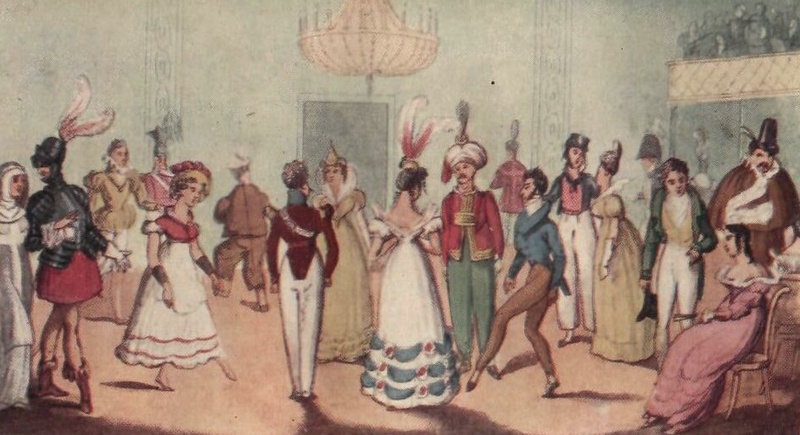 Here's an image from a Regency-era novel showing a fancy dress ball (similar to a masquerade but without masks). At left there's a woman dressed as a nun escorted by a gentleman in a knight's costume. In the background there's a woman in a pseudo-Elizabethan outfit. Next to them is a woman in pink and white whose headdress has a set of pom-poms or flowers on it; she probably represents some abstract concept. At center, a man in a Turkish costume shares a set with a man in regular clothes and another in military uniform; clearly not everyone felt impelled to dress in costume. Behind this group is a man dressed as a sailor and a woman in some sort of Renaissance-inspired outfit with a large white ruff. This 1811 image is from a caricature, so take it with a grain of salt. 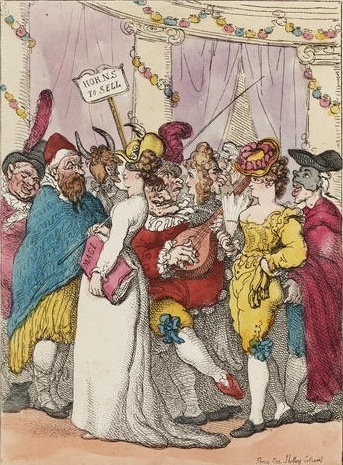 The immorality of the masquerade is emphasized with the nearly bare-breasted woman cross-dressed in front. The figure in the back with horns and the "Horns to sell" sign represents cuckoldry. The lute-playing musician at the front likewise suggests loose morals. At right, a man wears a burgundy domino over his regular clothing with a tricorn hat and mask. The woman in front with a large book is probably a sorceress. 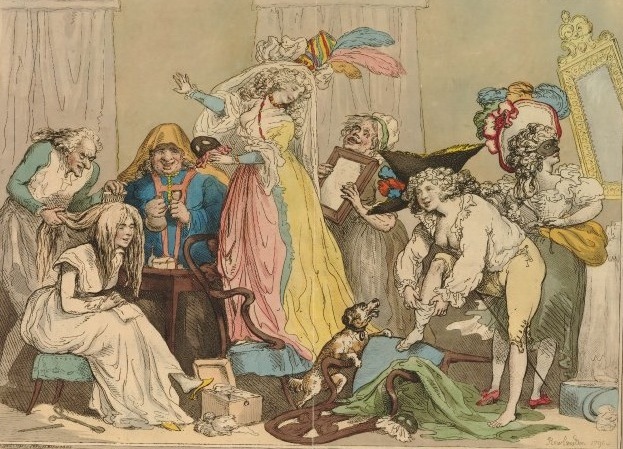 This is a bit pre-Regency, a caricature from 1790 showing women dressing for a masquerade ball. Again, don't take caricatures too seriously as a guide! The woman standing on the chair is probably in some sort of "Turkish" costume with her colorful headpiece. The woman in front is cross-dressing in her knee breeches. The bare breasts wouldn't have been part of the outfit; that's artistic license to imply how improper masquerades were. Notice how simple the masks are here; just little black half-masks or possibly (on the woman at far right) a black scarf with eye holes. Fig. No. 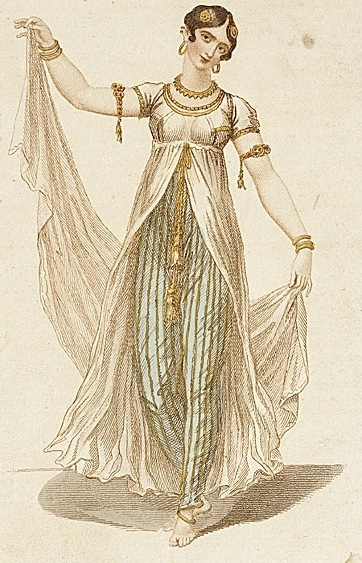 1.--An Egyptian Costume.-- The head-dress is composed of a rich handkerchief of white lace, which crosses the back part of the head; each corner of the handkerchief, a small distance from the shoulder, falls on the front of the neck; the handkerchief is trimmed round with a magnificient border of peals, and each corner is finished with a bunch of the same; the hair is curled on the top of the forehead with small thick curls, separated with a band of diamonds, which crosses the forehead, and continues round the head; two small curls down the side of the face. A rich white figured sarsnet dress made with a short trian, and scollope back; sleeves very short and covered with a broad flap of white lace; the undersleeve is trimmed round with small French pearls; also the lace, which is fastend to the back part of the sarsnet sleeve with a star of pearls; the front is made full each way, and covered with rich lace fastened in the centre with a star to correspond with the sleeves. An Egyptian train of lilac spider net, showered with pearls, and worked in the centre with a large star of the same, cut in the form of a half handkerchief, wider a one end than at the other; one end is cut square, and gathered up full on the left shoulder with a pearl star; a piece of sarsnet, from under the left arm, richly ornamented, crosses the front, and is fastened with the middle corner of the train to the right knee with a bunch of pearls; the other corner, which reaches to the bottom of the dress, is finished with a large pearl tassel; the dress and train are trimmed round with pearls to correspond. White kid gloves and shoes. This is another plate from Beau Monde, from the November 1809 issue. I don't have any description for this one, and I'm not even certain whether it was meant for masquerade or just a depiction of foreign costume. It's labeled "A Lady of Hindoostan", which in this context means India. It would certainly work for a masquerade, though the trousers would be fairly shocking. 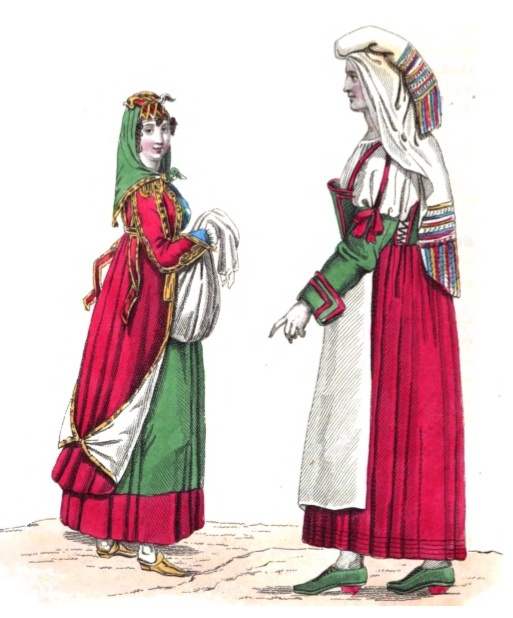 (Left) Costume of the Isle of Procida, Naples. 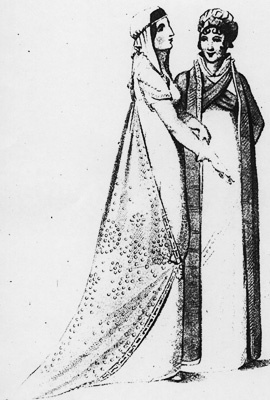 Dress of twilled sarsnet of a bright emerald colour, made high and plain, with a stomacher of gold lace, the skirt terminated by a broad border of scarlet cloth; the pelisse or surtout en militaire of scarlet cloth, lined with white satin and edged with gold lace, the skirt is open in front and reaches only to the border of the under dress; it is turned back, and the corners fastened together behind a gold clasp. The body and sleeves are made close to the shape and ornamented at the seams with gold lace; bands of scarlet edged with gold hang loose from the waist, which is encircled by a gold belt with a splendid clasp in front; epaulettes to correspond; triangular cuffs of Tyrian blue velvet edged with gold; ruffles of the finest lace. The hair is confined, except a few curls on the temples, by a scarlet and gold checquered silk fazzoletto, tied in front near the top of the head and concealing the corner of a green silk barège fazzoletto, which is edged with gold lace: the oppoite corner reaches nearly as low as the waist and is ornamented with a gold tassel; the other corners tie in a knot with long ends under the chin; lace apron, white silk stockings, gold colour satin shoes, pointed on the instep, lilac kid gloves. (Right) Costume of Ostia, Rome. Camisole of fine lawn made very full, and arranged in perpendicular plaits; the sleeves wide and set in wristbands; stiffened bodice of green cashmere, bordered and trimmed with geranium colour riband, open at the side, and laced with green cord, displaying the camisole beneath. The shoulder-straps are very long bands of geranium colour, and from the centre of each descends a similar band reading to a green cashmere; close upper sleeve, which extends half way between the shoulder and the elbow, and is decorated by a bow of geranium colour riband; the cuff is turned back, and has square corners, ornamented by two rows of riband; geranium colour petticoat of Swiss stuff bordered by two rows of narrow black velvet; apron of white lawn. Hair dressed a la Madonna, entirely concealed by the head-dress, which is formed of a delicate transparent white shawl, enlivened by ends embroidered in rows of the brithest colours, and a deep fringe to correspond. Michael Angelo has beautifully introduced this head-dress frequently in his paintings; the half of the shawl is rolled up and placed on the top of the head, the other half spreading wide over the shoulders, and when the fair wearer chooses, closes in front, and conceals the face; grey stockings, green shoes, with scarlet heels.